Dementia is a horrible condition that rips a person of who they are. I was only 13 when my grandfather started his gradual descent into the dark world that is dementia. It started with the small things, like forgetting where he put his things and forgetting my name. "Oh! That's a beautiful name." "I'm your granddaughter. My name is Camillia." I don't remember much of my grandfather before dementia stripped him of his memories. To me, my grandfather was a silent figure who was always there at the corners of my best memories. At that point, we never thought he might be suffering from dementia. In fact, we hadn't even heard of the condition till a year later. MY GRANDFATHER AT OUR ANNUAL CHRISTMAS BREAKFAST IN 2013. When I was 14, my grandfather was walking back to his bed when he slipped, fell, and broke his hip. In the hospital, he was treated by a diuretic doctor who noticed that something was off. He kept forgetting why he was in the hospital and he would scream at the nurses, thinking that they were keeping him captive. The doctor soon realised he was exhibiting signs of dementia, and that was when he was officially diagnosed. From then, my grandfather began to forget our names. He couldn't remember how we were related to him. He forgot how to walk and how to eat at times. We had to get him a baby gate with a complicated lock, to make sure he didn't tumble down the stairs. He needed to be fed, and he had to stop going to church. In a way, he had regressed to a child-like state. We tried our hardest to help him, and to play along when he mixed people up and forgot his own name. We craved his rare moments of lucidity and feverishly recorded them to remind ourselves that he was still there. It became really difficult for us because even though he was there, he also wasn't there. We just never knew what he would forget next, and that was scary. IN A WAY, HIS CONDITION BROUGHT US TOGETHER AS A FAMILY. WE OFTEN WENT TO THE BEACH OR MACRITCHIE RESERVOIR TOGETHER, JUST SO THAT WE COULD BRING HIM OUT. 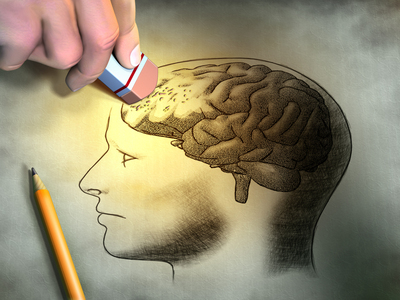 Dementia is a degenerative memory-loss condition that is incurable. It is also largely hereditary. Dr Marcus Tan, an associate consultant of geriatric psychiatry at the Institute of Mental Health, said: "Family history of dementia is an important risk factor for the development of Alzheimer's Dementia. 30 to 40 per cent of early onset cases of Alzheimer's Dementia have been shown to be due to mutations in certain genes, and these mutations can be inherited." He added: "Currently, there is no definitive cure for dementia." For me, that's a very scary thing to hear because I don't think I am ready to go through this phase again with my own dad. Seeing my grandfather forgetting his children was a lot for me to take in. Coupled with the fact that I myself am prone to the condition, it is safe to say that I am pretty freaked out. Dementia may seem like a condition that only affects the elderly, but it can also affect young people. Dr Tan shared: "A 2009 study in Japan estimated the prevalence of young onset dementia to be 42.3 cases per 100,000 individuals." However, Dr Tan mentioned that by correcting reversible conditions, such as alcoholism and nutritional deficiencies, one could help slow down the effects of dementia. SIMPLE COLOURING ACTIVITIES OR MEMORY GAMES CAN HELP TO SLOW DOWN THE EFFECTS OF DEMENTIA AS WELL. If you are currently dealing with someone with dementia, remember to be patient and to show them love. Find out as much as you can about dementia, and help them remain mentally active and healthy. "People diagnosed [with] dementia often feel vulnerable, especially if they are aware of their declining cognitive difficulties. [They] will need loving, support and reassurance," said Dr Tan. It is normal to get angry and upset when the person you love has asked you who you are five times in the last 10 minutes. Just remember that they are trying as hard as they can, and love them as much as you can. THERE ARE MANY FACILITIES AND ORGANISATIONS THAT CAN HELP TAKE CARE OF PEOPLE WITH DEMENTIA. My grandfather died peacefully in 2014 after spending Christmas surrounded by the people who loved him most. In a way, I am glad that he is in a better place, where he doesn't have to spend his days blankly staring out a window any more.